Grace amidst a private arboretum in Issaquah. 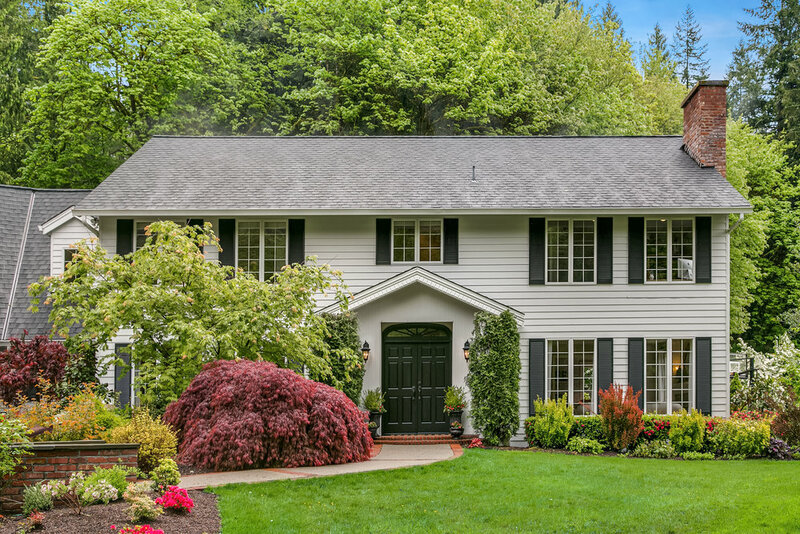 This is a gorgeous colonial home in a truly spectacular natural setting just off a bucolic country lane in South Issaquah. With a sweeping drive to a beautifully landscaped entry and three-car garage, the residence sits serenely on an acre and a half of meticulously curated mature landscaping, backing up to a creek and native forest that provides a breathtaking backdrop to a vast array of rare cultivars and plant species. With expansive lawns and groomed open spaces, living in this splendid oasis is like inhabiting a private arboretum. The residence is a carefully scaled interpretation of classic colonial architecture, with symmetrically placed shuttered windows surrounding the gracious central entry of the main house, and dormered rooflines atop the garage and its two-story connecting structure. A gently arcing path leads up to the formal double door entry which opens into a large foyer with room for a table and an elegantly curved main staircase that leads up to the second floor. To the right is a spacious and light filled living room that is anchored by a wood-burning fireplace set into a pilastered mantel with tumbled stone surround. Extra tall first floor windows capture lush views of the surrounding grounds and gardens, while light toned wide plank maple floors help create a sunny and uplifting atmosphere. 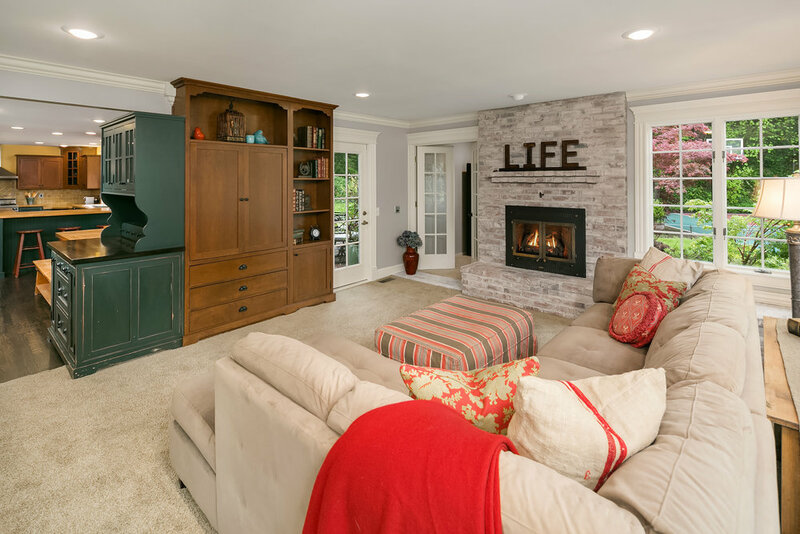 The living room opens to a similarly large family area with custom built-ins and a brick fireplace wall. 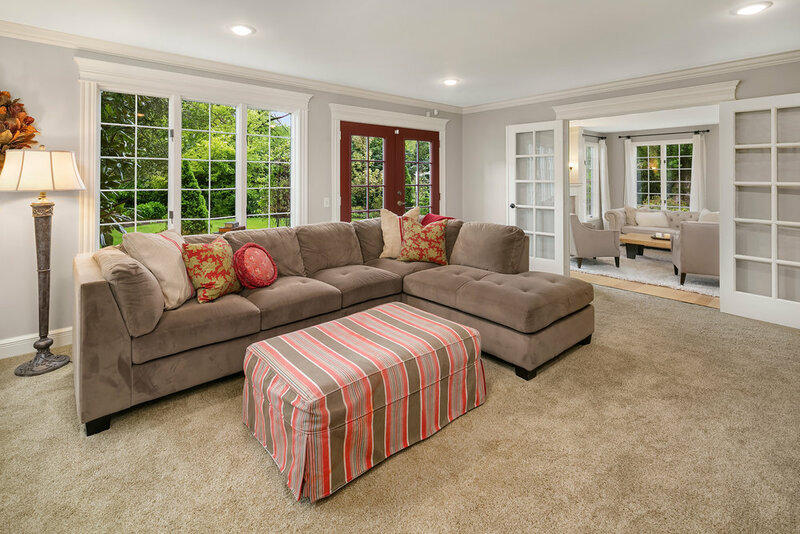 This area is perfectly set up for casual entertaining and relaxation with easy access to the kitchen and connecting informal dining area and access to the back and side yards through two sets of French doors. Ample recessed lighting and a separate home office/storage area further enhance the room’s daily functionality. The den opens into the stunning gourmet kitchen, complete with highly detailed custom cabinetry designed to resemble individual pieces of casework. All finishes are either weathered paint or rich cherry and there is a large, free-standing island with built-in microwave. Countertops are thick butcher block, with custom glazed subway tile backsplashes and all appliances are top-of-the-line Viking, including an integrated refrigerator, 36” gas range, hood and trash compactor, with a new Miele dishwasher. Extra deep counters are illuminated by a large kitchen bay window that frames outlooks over the yard and sport court, and a casual dining area with dining bar occupies the area between kitchen and den. The main circular floor plan is completed by a spacious dining room that overlooks the front entry of the house, through tall casement windows. 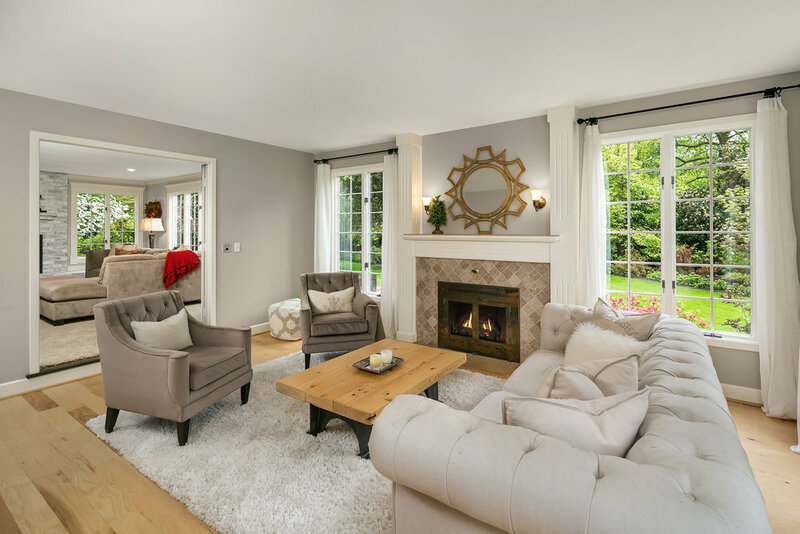 A multi-pendant chandelier lends the area a feeling of relaxed grandeur, and the elegant color scheme is accented by intricate white trim and wainscoting, with custom tailored window treatments. 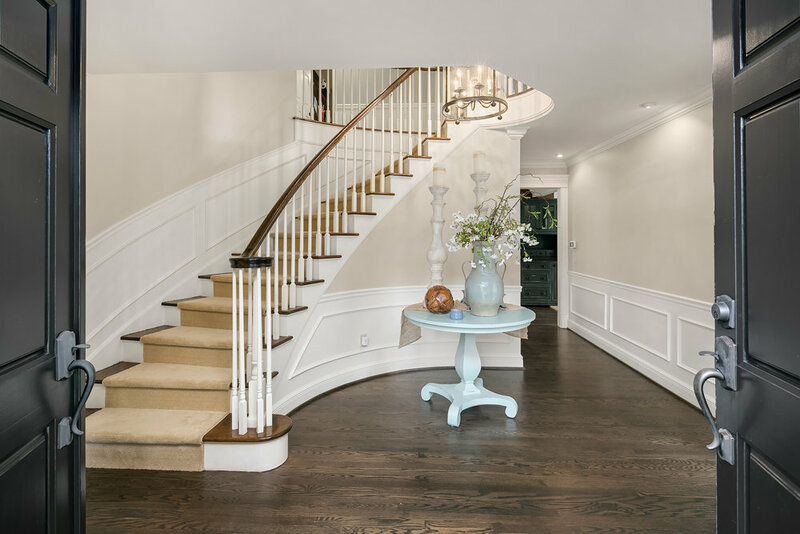 All floors throughout the entry hall, kitchen and dining rooms are espresso-finished oak to create a strong visual grounding for the rooms, and elegant colonial casework and trim completes the doorways and passageways. An additional wing of the house is accessed via a wide, wainscoted hallway off the kitchen. To the immediate right, sits a spacious laundry room with built-ins for storage and folding, new Samsung steam washer and dryer, cork floors and plenty of pantry storage space. A separate, enclosed water closet is a further convenience, and the room opens directly onto the backyard deck. 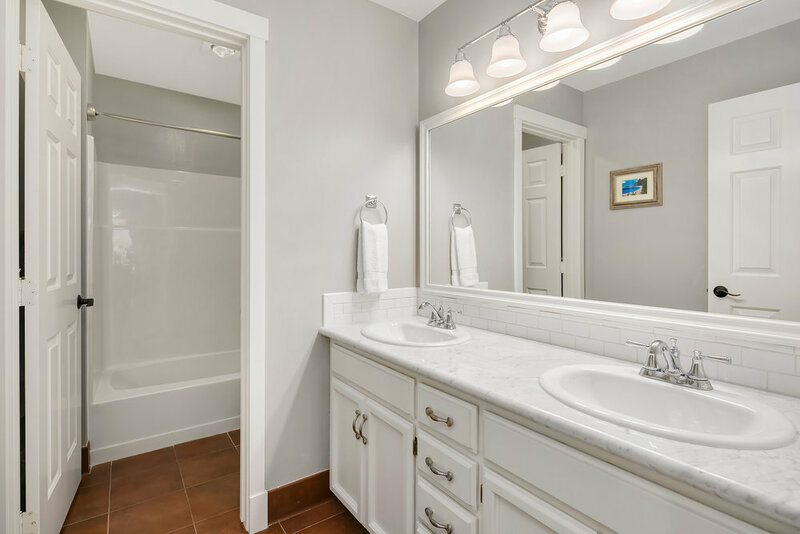 Across the hall from the laundry room is a well-proportioned home office space with recessed lighting and a wide closet that could easily perform double duty as an additional bedroom. At the end of the hallway, a wide staircase with landing winds up to the second level bonus room. 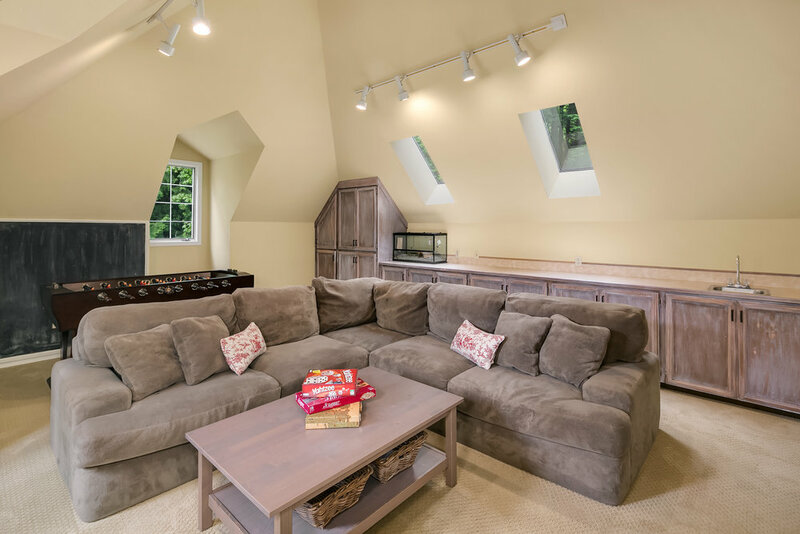 This huge area features vaulted ceilings with adjustable track lighting and numerous dormered windows that overlook both front and back yards, and includes a wall of built-ins with a sink, making this the perfect retreat for family movie and games nights, craft projects and football Sundays. Upstairs, a spacious and light-filled master suite occupies its own section of the house, atop the gracious main staircase, and is accessed off a circular landing that serves as an oculus to the main floor. The bedroom overlooks the side yard and surrounding forest and connects to an opulent ensuite bath that includes a wide, two-sink vanity with slab Carerra marble counter and subway tile backsplash, built-in makeup table and storage, as well as a large walk-in shower and water closet. A huge walk-in closet with custom built-in organization completes this elegant and restful retreat. 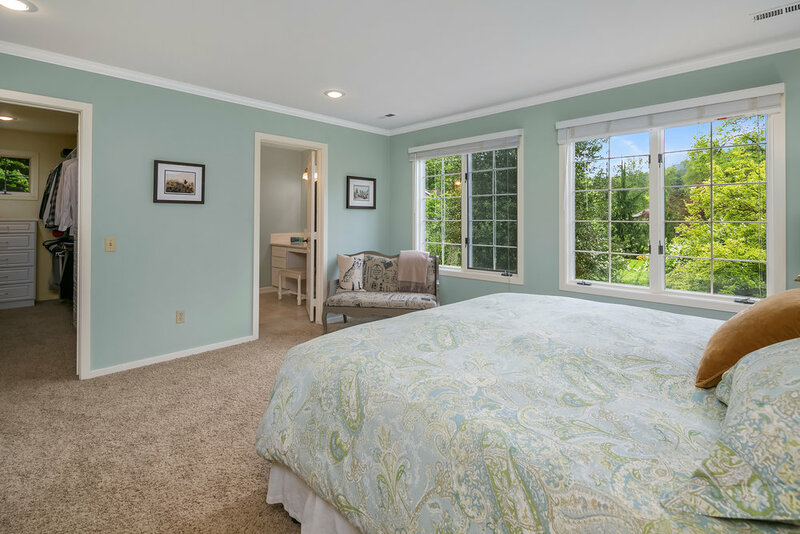 An additional bedroom that can also function as a home office or nursery lies to the immediate right of the master suite and connects to another bedroom on the front of the house through a Jack and Jill bath along a private hall. All bath surfaces are Carrera marble and subway tile for a finish that is fresh and clean in practice, yet elegant and historic in style. Two additional bedrooms occupy the other side of the main upstairs hall, separated by a spacious bath with double sink vanity and separate water closet and bathing room. Both of these bedrooms overlook the back yard and provide tons of closet and living space, making them ideal for older children, guests or multi-generational families. All upstairs rooms are crisply detailed with crown molding, designer lighting fixtures and an elegantly neutral color palette. A large storage and utility closet finishes off the second floor with easy access to the home’s central mechanical systems. 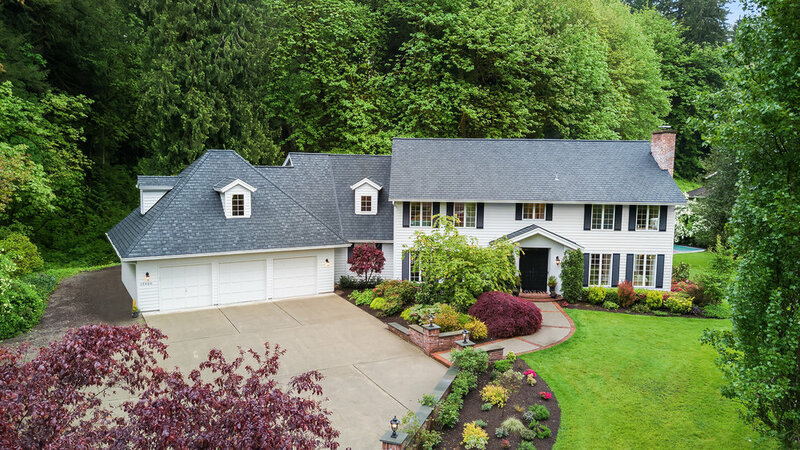 The overall sensibility of this classic Issaquah residence is one of refined, yet casual elegance that reflects its lush mountain surroundings and celebrates a lifestyle that is at home indoors as it is outside, enjoying beautifully landscaped level grounds. A large ipé deck off the back is the ideal place for barbecues and outdoor events, and it opens graciously onto a huge lawn that is a dream for outdoor recreation. The sport court in the back yard makes this a wonderful home for those with active families and provides endless healthy options for play.
. The current owners are passionate gardeners, and have created an oasis of year-round color and texture in the home’s yards. Mature specimen trees contrast beautifully with rose gardens, rare cultivars and dense native plantings to define a series of outdoor rooms that embrace the house, gently connecting it with its natural surroundings. 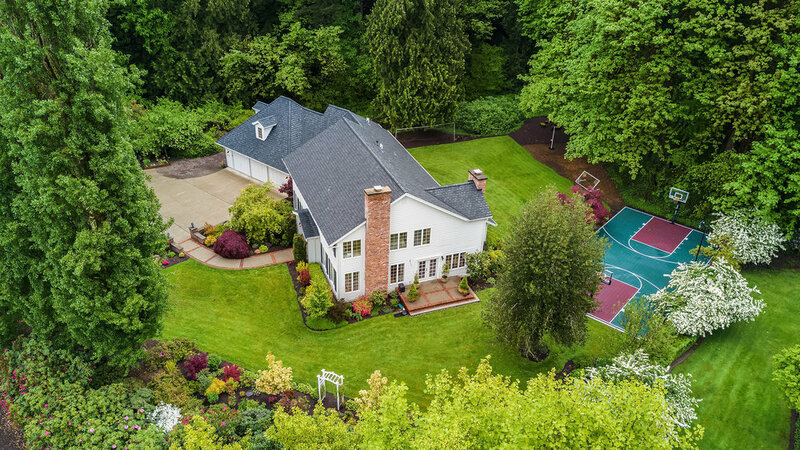 Life in this graceful Issaquah home is an ideal blend of country charm with incredible regional connectedness in which horse farms and vegetable stands become part of the daily commute. With award-winning schools and easy access to Seattle, Bellevue and the entire Eastside tech corridor, Issaquah affords its residents a singular lifestyle that combines the best of urban amenities with some of the region’s most exceptional outdoor recreation and natural beauty. The home’s location affords it a serene sense of privacy and connectedness to its exquisite Northwest surroundings, and allows easy access to everything from day hikes to skiing. Issaquah is a charming town within easy reach of both Downtown Seattle and the Eastside tech corridor, yet it provides a lifestyle that is calm and friendly – evocative of the Main Streets of a bygone era.